Rechargeable LED Tea Light Candles [Rech. LED TeaLightCandl RT06G] - $34.95 : NewDaVincis.com!, Great Innovative Products, Gadgets and more. Enjoy the beautiful realistic candle light glow anywhere in your home without flames, smoke or spilled wax of traditional candles. Glass votives can easily be cleaned in the dishwasher. lighting for both, indoors & out! Each flickering LED Tea-Light in this set of six electronic tea-lights provides a beautiful realistic Tea-Light glow that will never burn out. 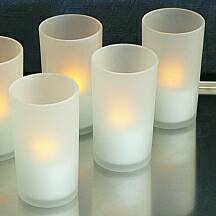 They are the same size as a regular T-lights so they can be placed within frosted glass votives or they can be used with our wax overlay candle sets. A great choice for mood lighting both indoors and outdoors of the home! 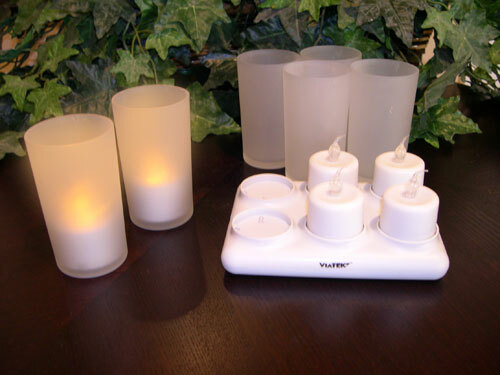 Weather your are decorating for specific occasion or just setting the mood these Rechargeable Tea-lights are the perfect way to add that something extra! The Lock 'N' Charge base ensures a full charge.
? Looks like a real candle !
? Lifetime flickering LED bulbs !